We are starting the year with a tip about what may be the best brunch place in Toronto. Karelia Kitchen (1194 Bloor St W, Toronto, ON M6H 1N2, Canada) is dedicated to all things Scandinavian for brunch, snacktime and dinner. Karelia’s brunch is a mix of continental, Canadian and Scandinavian flavors with dishes like Pitti Y Panna ($14) Swedish-style potato hash with dill, bacon and eggs; Herring Two Ways ($14); and a grilled cheese made with Canadian Oka cheese ($12). For something more savory, there is also a huge variety of smorrebrod – open faced sandwiches in varieties like salmon, shrimp and beet ($10-12). In true Scandinavian fashion, coffee is a major feature of the cafe, and there is also a wide assortment Scandinavian pastries for a true Swedish-style fika coffee break. It can get pretty crowded for brunch, so reservations are recommended. But even if you don’t have a reservation, you can order at the counter to go. Even with all of this selection, our favorite thing about Karelia Kitchen is that they have Pulla Bread! Pulla bread is a traditional Finnish cardamom bread, which is particularly hard to find pretty much anywhere in North America, and this quest is what initially led us to Karelia. Pulla is a relative of the Swedish cardamom bun, kardemummabullar, and may be found in braided loaves like brioche, or in smaller rolls (as seen below). Served with clotted cream and lingonberry jam, a pulla roll is a prefect not-too-sweet accompaniment for fika or breakfast (or a snack). 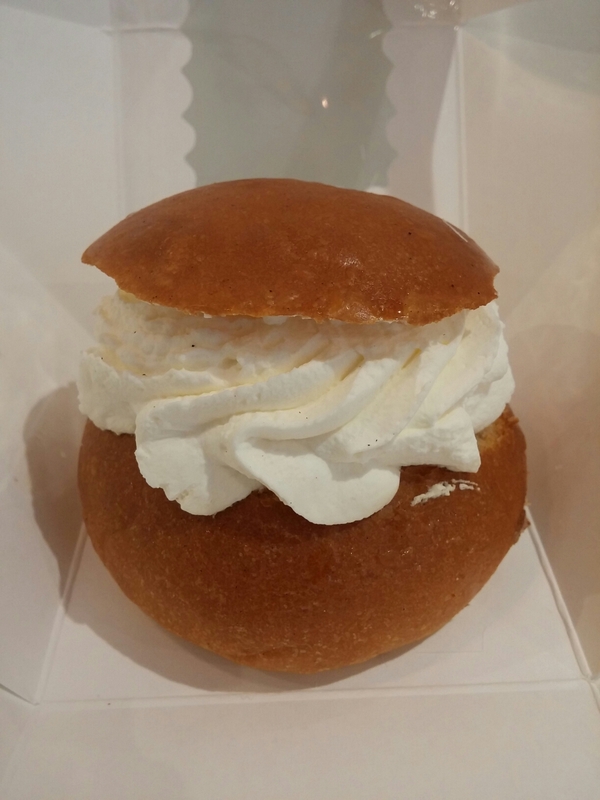 If you have the chance head over to Karelia to sample the excellent pulla bread and more! Today is the Summer solstice – the longest day of the year! That means it is also time for Midsummer / Midsommar festivals in Sweden and throughout Scandinavia. While you may not have access to a maypole (majstång or midsommarstång), get outside, put on a flower crown and serve up some delicious treats, and you will be celebrating Midsummer like a Swede (Kitchn called some actual Swedes for their take, and that seems to cover it). Midsommar festivals and meals typically happen outdoors, in order to full enjoy the beauty of summer, and the super-late sunsets. Herring is a popular dish on the Swedish Midsommar table, as are new potatoes, fresh strawberries and a little aperitif like Akavit. Tasting Table, Serious Eats, The Kitchn, and Saveur have Midsommer menus for your own celebration. I think tonight’s dinner is going to be al fresco. Tre Kronor (“Three Crowns” in Swedish), a local Scandinavian bistro, has been on our to-do list for quite a while, but it was just far away enough to keep eluding us. We finally found the perfect time to go, when we were looking for a place to catch up with a friend for brunch. Now we are usually pretty skeptical of brunch, but Tre Kronor seemed laid back enough to give a try. Tre Kronor (3258 W Foster Ave, Chicago, IL 60625) is located in the quiet North Park neighborhood, and is adjacent to one of the cutest stores around – the Sweden Shop (3304 W Foster Ave) which sells all manner of Scandinavian design items, cards and food. We could spend hours just browsing around – you won’t be disappointed. 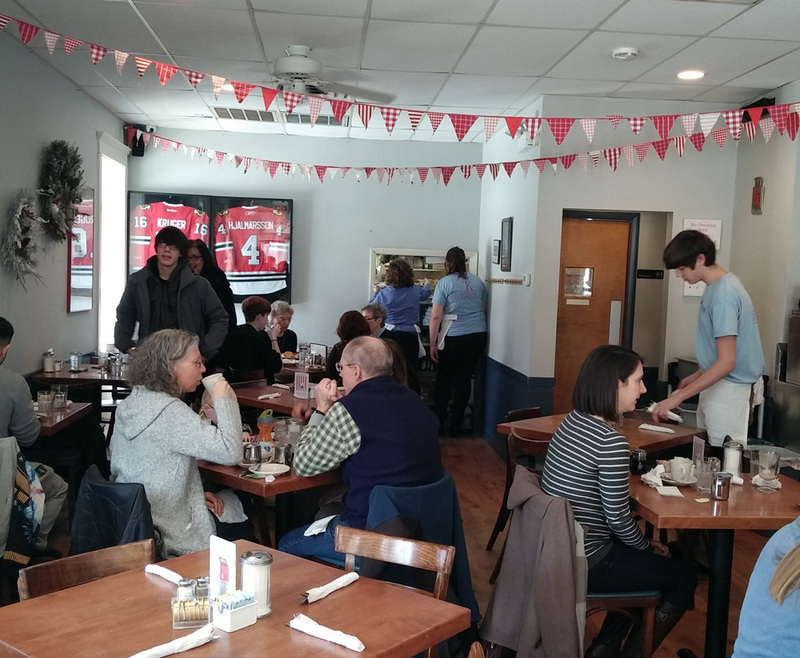 The first thing you will notice when you walk in to Tre Kronor is the cheerful gnome mural, and the strings of flags displayed on the walls, giving it a very homey atmosphere. Though they do breakfast, lunch and dinner, they seemed to be pretty popular for brunch, and we just barely squeezed in (no reservations accepted, so prepare for a wait). The menu at Tre Kronor is pretty varied, but there is a marked Scandinavian flavor throughout, and especially on the dinner portion which includes seafood staples like Gravlax and pickled herring. 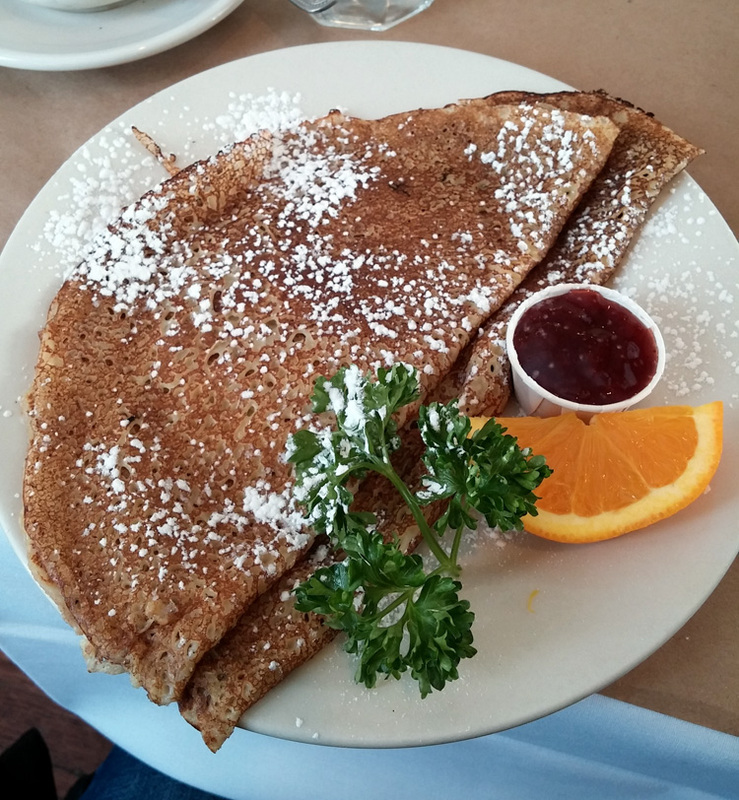 However, for brunch, we knew we absolutely had to order the Swedish pancakes – pannekaker – with lingonberry jam. Other options included omelettes with Scandinavian cheeses, pickled herring, and the more Americanized brunch items: French Toast and waffles. M, of course, went with his brunch staple, the French Toast. If you are feeling more like lunch, you can also pick among a variety of Swedish-tinged sandwiches and can even get a burger. We heard they were known for their known for their coffee and their cinnamon rolls as well, so I ordered a cappuccino, which was delicious, with an impressive amount of foam (see below). The food came out promptly, and everything was delicious. The Swedish pancakes were light and fluffy, and the french toast was crisp and golden brown. Also of note, Tre Kronor has an assortment of esoteric sausages, rotating on a daily basis. The day we were there, there was a potato sausage, which was delightful and mild, and a bacon sausage, which M thought was a revelation. What guy wouldn’t want a sausage made out of bacon? Our young server was very nice and helpful, and we appreciated his enthusiasm (as well as his Swedish idiom T-shirt). 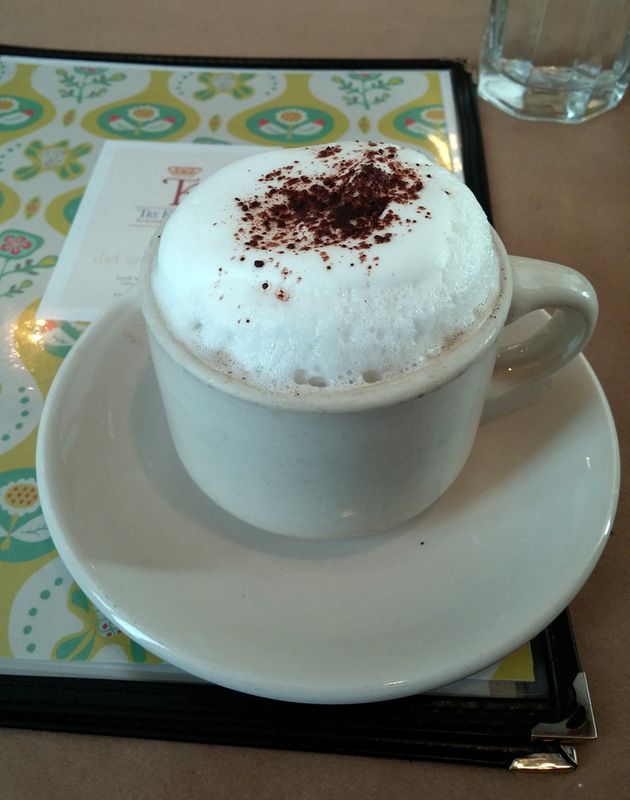 We thoroughly enjoyed brunch at Tre Kronor: the food was tasty, and the atmosphere was comfortable and relaxed. We are not big on brunch, but Tre Kronor may have just charmed us into changing our ways. 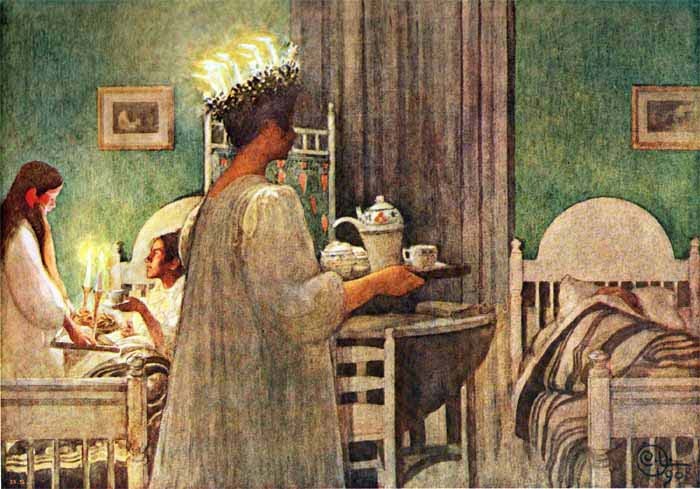 Carl Larsson is a Swedish Arts and Crafts painter, who is known for his scenes of everyday turn-of-the-century Swedish life, and especially for depicting his own home and family. His paintings have also become associated with St. Lucia’s Day (December 13th), due to his popular depictions of the Swedish folk festival. His St. Lucia pictures include the traditional treats, but those were not his only paintings of Swedish food culture. As you can see below, the Swedish table was one of his favorite subjects. In an earlier post we wrote about Sweden’s iconic multi-layered Princess Cake (Prinsesstårta) – which seems equally delicious and daunting. Swedish Prinsesstårta was the May 2013 challenge for Daring Bakers, an online baking group, and the result was a lot of delicious-sounding takes on this tricky tart. May Daring Bakers Host Korena in the Kitchen has a very thorough description of how to make the cakes, for those of you that want to go traditional. Alternative versions include: Prinsesstårta cupcakes, Strawberry-Oreo Prinsesstårta, and Green Tea Prinsesstårta, among others. Prinsesstarta diagram from Baking Obsession– complicated! St. Lucia’s Day is a Swedish holiday that occurs on December 13th, marked by feasts and candles. Despite it being pretty dark in Sweden in the weeks leading up the Christmas, St. Lucia’s day and Advent as a whole are a great time of celebration filled with lots of light. We have written about some sweet treats like Lussekatter and pepparkakor that are used to celebrate the holidays in Sweden, but if you need some warming up the best prescription is Glögg, a mulled red wine. Glögg is so integral to the holiday season, there are dedicated “Glögg parties.” While you can buy Glögg at many stores, it is definitely more fun to make your own. We love daily snack rituals, and we just learned of Sweden’s tradition of Fika. Fika is analogous to British teatime, though a Swedish Fika usually comprises of coffee and a sweet snack. Apparently Fika is so ingrained in Swedish psyche that it has become both a noun and a verb (“do you want to Fika?”), and is a daily ritual honored by both young and old. Fikabröd (“fika bread”) is the name for the sweet snacks (cookies, tarts, breads, cakes, etc.) that are part of a Fika, and there are sometimes even Fika buffets with a variety of sweet treats. If you are looking for an authentic Fika, and you happen to be in the NYC area, you can visit the aptly-named Fika Coffee Shop. One of the most striking cakes we have ever seen is the Swedish Prinsesstårta, or “Princess cake.” It is called a princess cake because it was said to be a favorite of the daughters of Prince Carl, Duke of Västergötland – princesses Margaretha, Märtha and Astrid. 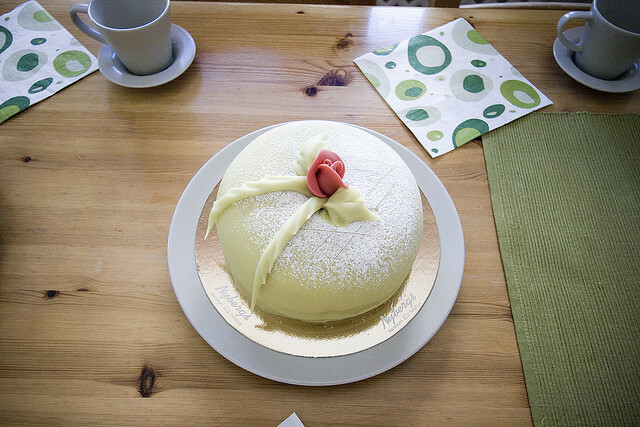 Since its creation in the 1930s, it has been popular for special occasions in Sweden. This festive cake is covered in green marzipan, one of the rare sweets to have green as its principal color. CakeSpy did a wonderful post researching why the princess cake is green (unfortunately the answer is still unknown). The cake, while beautiful, seems fairly labor intensive. Just take a look at the cross section on the Baking Obsession site for a better idea – the components are layers of genoise cake, jam, and buttercream, all covered by a dome of whipped cream and the distinctive marzipan. If you are feeling up to the task War and Yeast and have great step-by-step recipes. We think we will stick to getting the cake from the experts, Swedish Bakery (5348 N. Clark, Chicago). Little known fact: One of the Eaters is partially Swedish – and though we are not particularly keen on Swedish food – there is no denying the appeal of the delicious cookies and pastries served on St. Lucia’s Day. One of the most traditional are the Lussekatter – saffron sweet rolls. The name means “Lucy’s Cats” – but these leavened yeast rolls are figure-8 shaped. And here are even some Gluten-free versions of traditional St. Lucia items – something for everyone.